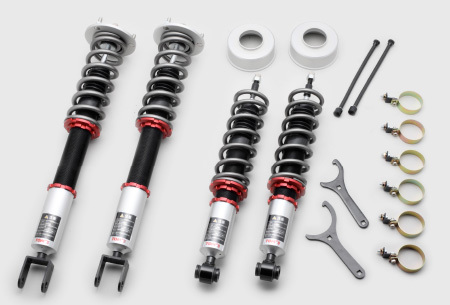 Please be advised that TOM’S newly launched “TOM’S Racing” Suspension Kit for LEXUS LC500(URZ100) through our distributor / agent in your country from Feb. 2018. We would ask you to renew your same patronage for new products as for existing products. Mainly focusing on the setting, riding comfort and controllability in usually use areas such as urban areas and Winding Road. In addition, high-end suspension repeatedly tested in Fuji Speedway by Super GT racing driver. ※Vehicle height down to be considered as reference. ※By vehicle height down, tire and wheel may interfere with fender/ wheel. Please be careful to adjust vehicle height to confirm no interference. ※There is a possibility that some vehicle cannot clear minimum vehicle height （90ｍｍ）, which is defined by regulation. Please adjust vehicle height with confirmation for that. Order can be placed for TOM’S Products by part ordering system ‘ai21’ for Toyota dealers in Japan. You can contact for Product inquiry with the below TEL no. TOM'S INC. All rights reserved.